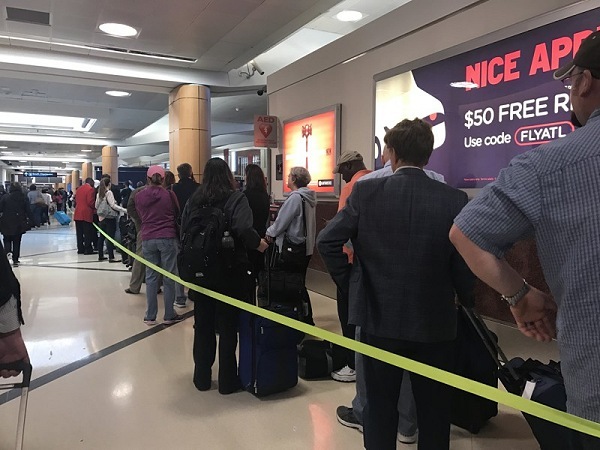 Thousands of travelers waited in long lines stretching through the terminal at Hartsfield-Jackson International Airport on Thursday, the messy aftermath of mass flight cancellations due to thunderstorms the day before. Delta Air Lines cancelled roughly 500 flights Thursday due to planes being out of position, crews being out of place and crew rest requirements after Wednesday’s storms, according to Delta spokesman Michael Thomas. That came after the airline cancelled about 700 flights Wednesday and diverted more than 60 flights. That’s significantly more than the 300 flight cancellations Delta had expected earlier in the day. At mid-afternoon Thursday, a ground delay program was causing delays averaging 2 hours and 29 minutes for arriving flights, according to the Federal Aviation Administration. Many travelers were trying to get rebooked on flights back home or to their destinations after spending the night in the airport, while others waited in a long line for baggage assistance. The combination of a busy spring break week with many families and children traveling and a worse-than expected storm led to major pain for travelers. While some travelers resorted to searching for rental cars to drive home, many vehicles were already taken because of the Masters Tournament in Augusta. Delta has issued a change fee waiver for travelers affected by the delays. To view the conditions of the waiver, click here.